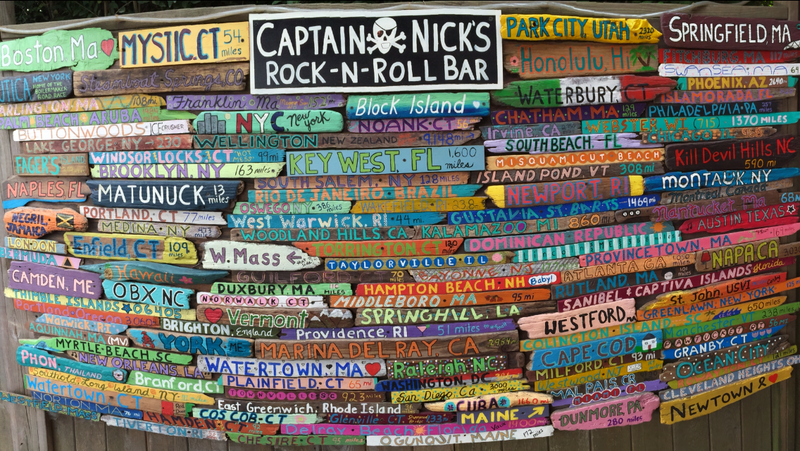 Captain Nick's is a seasonal watering hole located on Block Island, Rhode Island. We are known as a nightclub and music venue, but also as a welcome gathering place for all to enjoy talented entertainment, drink fun cocktails, meet great people, and relax in a positive atmosphere. (You can also expect to be dancing at some point. )We pride ourselves on offering a range of entertainment genres for all ages, even the littlest ones on Sunday afternoons. The wood for the signs was respectfully collected on the beaches of Block Island, Misquamicut State Beaches, and Sandy Point, Watch Hill. We encourage you to make your own sign and bring it to us to hang. If you aren't ready for that, at least stop and take a selfie!